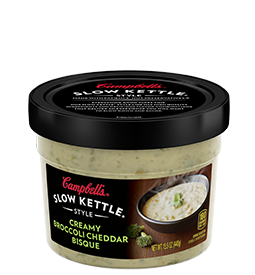 Campbell’s Slow Kettle soups were on sale at ShopRite last week so I picked up two of the Broccoli Cheddar and it was majorly disappointing. After the rubber cap is removed there is a metal pull-tab at the top. Opening it was a little messy since Bisque is waterry but the disappointment came when I realized I couldn't nuke in this same container. The instructions say to pry the metal ring off if I want to nuke but that's impossible! I ended up heating it on the stove while trying to pry the ring off with a knife since my aunts usually appreciate small containers like this. All I managed to do was warp the can. I finally gave up before cutting myself. Then I rinsed it out to recycle but I couldn't because of its metal/plastic hybridness. By then my soup was ready. It was waterry, as expected and left me feeling hungry but at the same time as if I'd eaten something very heavy - thanks to the amount of cheese in the soup. The calories were pretty high for such a small container too so I won't be buying these again.